Everybody knows that college is expensive—and that choosing a school is one of the biggest financial decisions many families ever have to make. With tuition, room and board, textbooks, and incidental costs, a public university could run you $20,000 a year or more, even if you qualify for in-state tuition. 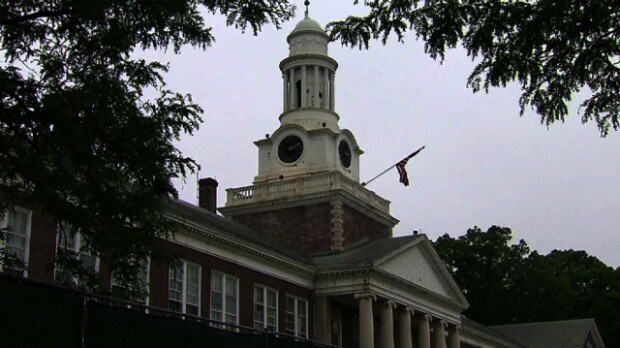 A highly selective private college can set you back $70,000. Even families who are well aware of the cost of college are often surprised when the bills actually start coming due. Half of today’s students and parents of current students report that college has turned out to be even more expensive than they expected, according to a new survey by MONEY and Barnes & Noble College. And the financial impact of the college you choose doesn’t end when you write your final tuition check or make your last loan payment. Jordan Matsudaira, a Cornell economist who oversaw the creation of the federal government’s new College Scorecard website, notes that which college a student attends can affect his or her future income by as much as 20% a year, or an average of nearly $600,000 in lifetime earnings. The long-term financial burden doesn’t fall entirely on the student, of course. More than three-quarters of the parents in our survey say they had made financial sacrifices to pay for their child’s education, from delaying major purchases to cutting back on retirement saving. Given that few Americans are saving enough for retirement to begin with, that could put them in a serious financial pinch after their working years come to an end. Don’t expect to find all the information you need to make a smart financial choice on colleges’ websites or in the glossy brochures they mail out by the millions this time of year. “Colleges make it almost impossible to estimate the true cost of a degree, to understand and compare their offers of financial aid, and to see what you’ll get for your money, such as whether their degree will help you land a decent job,” says Mark Schneider, a former head of the National Center for Education Statistics. That’s where we come in. MONEY and Schneider’s research firm, College Measures, partnered again this year to analyze all the latest higher-education data and apply the most up-to-date research to find the colleges that offer the best value for your tuition dollars—that is, a high-quality education at an affordable price and a head start in landing a fulfilling and well-paid career after graduation. 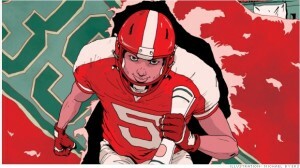 To see MONEY’s full college rankings, click here. For this year’s rankings MONEY judged colleges on 24 factors, including widely accepted quality measures such as graduation rates, affordability measures such as how much students and parents have to borrow, and measures of alumni success such as how much recent graduates earn. Another major component: MONEY’s exclusive “comparative value” scores, which assess how well students at each school fare compared with those at other schools where the students who attend come from similar academic and economic backgrounds. By controlling for the types of students that colleges admit and seeing how well they do after graduation, the rankings judge how much of a contribution the college made to their success in the years in between. For similar reasons the rankings also adjust earnings data to account for the mix of majors at each school. That way a college that graduates a lot of high-paid engineers, say, won’t have an unfair edge over one that produces more teachers or social workers. While earning a living is important, money isn’t everything, of course. Some 90% of parents and students in the MONEY/Barnes & Noble College survey rated “preparing for a fulfilling career” as a very or extremely valuable benefit of a college -education—about 20 percentage points higher than the number who said the same for “preparing for a high-paying career.” As a result, we’ve added a new factor to this year’s rankings methodology, taking into account the percentage of a school’s graduates who consider themselves to be in “meaningful” jobs, as reported to PayScale.com. The College Scorecard, a new federal website with information on alumni earnings and loan repayment rates, also supplied valuable data this year. We’ve incorporated the Scorecard’s findings on earnings, debt levels, and repayment rates (a good indicator of recent grads’ financial health) into our methodology. In all, the new federal data add the experiences of several million graduates to what we now know about specific colleges and the value they deliver. The colleges that are delivering top value today represent a diverse, sometimes surprising mix. They aren’t just the usual suspects—elite colleges that are accustomed to accolades—but major public universities and small liberal arts schools as well. You may be hearing about a few of them for the first time. MONEY’s analysis also shows that status and selectivity, which colleges love to hype, often have little correlation with quality. Nor does a college’s published sticker price tell you much about what you’ll be getting in terms of educational quality or career preparation—and schools do so much tuition discounting these days that most families don’t pay it anyway. The No. 1 school this year, Princeton University, is one of those usual suspects—but with a twist. While it carries a price tag of almost $65,000 a year, fewer than half of families actually pay that much. Princeton provides grants to 60% of its students, including full rides to those from families earning less than $60,000 a year and smaller grants to students from households earning as much as $200,000 a year. As a result, the typical Princeton student pays only about $20,000 a year—less than the cost of many in-state public colleges. In return, students get an education that ranks in the top 1% of all colleges in terms of academic quality. Plus, Princetonians’ average annual income of about $63,000 within five years of graduation puts the school into the top 2% of all colleges for alumni earnings. Many public universities, with admissions odds more favorable than Princeton’s, are terrific values as well. Coming in a close second in the rankings this year is the University of Michigan, a top-notch public school that’s highly affordable for in-state students. Michiganders with family incomes of about $70,000 or less generally get full-tuition scholarships and often additional grants for living expenses. And within a few years of graduation, alumni report average annual earnings of $59,000—12% higher than graduates of schools with similar student bodies. Likewise, recent graduates of Texas A&M, a public university that took the No. 13 spot, reported earning about $55,000 a year—$10,000 a year more than the typical new college grad. It’s no coincidence that many of the top colleges, such as Princeton, Michigan, Texas A&M, and Clemson, also have fiercely loyal alumni who are known to go out of their way to help new grads. In fact, our rankings give points to schools with formal programs to connect job-seeking undergraduates with alumni. Graduates of the 618 colleges in the rankings that provide such services earned an average of about $46,000 a year—$2,000 more than their peers at the other schools on the list. At No. 21–ranked Clemson, for example, the difference is more than $3,000. What’s more, the alumni advantage seems to continue for years. Mid-career alums from those 618 schools reported average annual salaries of over $80,000—$6,000 more than their less-connected peers. Research by the LIMRA Secure Retirement Institute suggests an even longer-term impact. A graduate who has to repay the typical student-debt load of about $30,000 will have less to contribute to retirement accounts over the years. By the time he or she retires, that could mean $325,000 less in retirement savings. Low debt is one reason the University of Florida ranks No. 15 this year. Its students graduated with an average debt of $15,000—$8,000 less than is average for other schools on the list and $15,000 less than the typical college grad. Of course, every student and family is unique. Your student may plan to become a teacher, say, and be more concerned about getting financial aid and not racking up debt than about pulling down a big salary. So along with our new rankings, MONEY is launching a new free web tool that allows you to create your own rankings by adjusting for the factors that are most important to you, such as a school’s generosity with need-based and merit aid and how likely its graduates are to end up in debt. Starting later this week, you’ll find it and additional online tools at money.com/colleges. As you explore the rankings, bear in mind that college lists—MONEY’s and everybody else’s—are best viewed as a starting point in your college search. So don’t get too hung up on small differences in the ranking numbers. Because of the imprecise nature of the data available to evaluate colleges, there may be little difference between schools with fairly close scores. If you’re a stellar student who gets into Princeton (No. 1) and Stanford (No. 10) plus, say, the University of Virginia (No. 9), choose whichever one you think will be the best fit—because it has an especially strong program in your desired major, gives you the best financial aid package, or provides some other unique benefit. They’re all great, high-value colleges. Same goes for B+/A– students comparing, say, Duquesne (No. 325) with schools in the same general ranking range, such as Susquehanna University (No. 313) and SUNY New Paltz (No. 345). The small differences among these schools will matter less than the financial aid package each college offers and whether it has strong offerings that match your interests. Graduation rates: Overall graduation rates are an important quality indicator because students who find a school lacking will often drop out or transfer to another college. But don’t stop there. At CollegeResults.org, you can check the four- and six-year rates of students, sorted by gender and by race, at each school to better predict your student’s odds of finishing. Available majors and activities: College happens both in the classroom and outside of it. Besides making sure that a school has enough courses in your student’s area of interest, ask about related clubs and extracurricular activities. Gallup research has found that students who were most likely to thrive in college were deeply involved in at least one extracurricular. Your real price: The federal government requires colleges to post a “net price calculator” on their websites to give you an estimated cost based on family income and other factors. The Net Price Calculator on the MONEY College Planner website lets you compare several colleges’ prices side by side. Job help: In today’s ultra-competitive job market, internships, connections to active alumni, and the school’s reputation with employers are critical. Ask the college’s career office what kinds of assistance it provides. And if your student already has some dream employers in mind, ask the college which companies recruit on campus. Equipped with the right data and other pertinent information, you might still be surprised by what college costs—except that this time, the surprise could be a pleasant one. Much of the playbook for taking on the $40,000 average sticker price of a private school is out-of-date or just plain wrong. You’ve pored through financial aid forms, knocked the priciest schools off your list, reviewed borrowing options, and nudged your kid to think more about engineering and less about English lit. So you figure you’ve got this college thing under control. Not quite. Those expensive schools you ruled out? They might actually cost you less in the long run than some cheaper private or public institutions. The federal loans for parents you’re looking at so your kid doesn’t graduate with debt? They may not be a better choice after all. As for thinking a technical major will be more helpful to Junior than a liberal arts degree … sorry, it doesn’t always turn out that way. Even among savvy parents, myths and misinformation abound. Yet with the average four-year tab ranging from $71,500 at in-state public colleges to $240,000 at elite private schools, the last thing you need is to pay more than necessary, borrow more than you can handle, or pass up a college that can provide a great education at an affordable price. What follow are the straight facts you need to make smart college choices. The myth: Saving for college will hurt your chances of getting financial aid. The reality: Any money you’re able to save probably won’t appreciably affect your chances for aid. Here’s why: Under the federal financial aid formula, what matters most is your income, which is assessed up to 47%. By contrast, a maximum of just 5.64% of savings in your name will be counted — after excluding retirement accounts, any small business you own, and your home equity. A savings allowance based on your age and marital status ($30,700 for a married parent age 45 for 2014-15) will also be deducted. As a result, parental savings typically have little impact in the government calculation of expected family contribution, says financial aid expert Mark Kantrowitz of Edvisor.com. Those savings will come in handy, though, to help pay that high expected contribution from your income. True, nearly 400 private schools additionally use their own aid formula, which may factor in home and business equity. A high earner with substantial assets might qualify for less or no need-based aid at those schools as a result. Chances are, though, any aid you’d get would be in the form of loans, not grants, so you’re still better off saving. Research from T. Rowe Price shows that each dollar you sock away could save you twice that amount in future borrowing costs. Make friends with a 529. Only about one in four parents who save for college uses a 529 plan, says student lender Sallie Mae. Big mistake. You get more bang for your buck in a 529, since the money grows tax-free and withdrawals are tax-free, too, as long as the cash is used for school. Look first to your state’s plan; more than half offer a tax break to residents. Other low-fee options include New York’s 529, Ohio College Advantage, and Wisconsin Edvest. Shelter your shelter. “All schools will assess real estate that isn’t your primary residence,” says financial aid a expert Kal Chany at Campus Consultants in New York City. If you own a second home or investment property, taking out a home-equity line of credit and using the money to pay down consumer debt (to avoid having loan proceeds count as assets) will temporarily reduce your equity — just make sure you can repay the loan. Play the name game. Have assets in a taxable account in your kid’s name? Uh-oh. They’ll be assessed at a 20% rate. Fix: Use the account over time to buy stuff for your child that you’d get anyway, such as a new laptop or SAT tutoring. Then put an equivalent amount into a 529 in your name, where it will be counted at the lower parent rate, says Joe Hurley, head of Savingforcollege.com. The myth: You can’t afford a private college. The reality: Don’t confuse the eye-popping sticker prices at private schools — $39,500 a year on average vs. $18,000 for the typical public college — with the price you’d actually pay. Discounting by private colleges, especially for good students, has become the norm. These discounts are typically awarded as merit aid and are given regardless of financial need. As the college-age population drops, schools are increasingly competing for students, sparking an awards arms race. In fact, today more students receive merit grants (44%) than get need-based aid (42%). Last year the average discount hit 45%, a record high, says the National Association of College and University Business Officers. To be sure, Ivy League universities and some other top private schools still offer mainly need-based aid, but their definition of need often extends to higher-income families. And merit aid is available at many other high-quality colleges. For instance, Rice University offers academic grants averaging $15,000 to 22% of students; at Denison, about 46% of students get merit awards, which average $16,300. Look for largesse. As your child begins to evaluate colleges, you’ll want to assess how generous each is with handouts. To find the percentage of students who get merit money, go to collegedata.com. For details about a specific college’s grants, check MeritAid.com. Some schools load in merit awards based on your student’s academic profile, while others give only a rough estimate. Either way, the results will be a good starting point for a discussion with the school’s aid officer. Also compare the results with net prices at any state colleges your child is interested in; merit awards are on the rise at public schools too. Improve your odds. Most private colleges are secretive about the formulas used to award merit aid. In general, your child has a better shot if her grades and SAT scores rank higher than the averages for a particular school, says Lynn O’Shaughnessy, head of Thecollegesolution.com. Other factors that may provide an edge: intended major (a less popular one can help), community service, and musical talent. Some colleges even rate your child’s interest in attending — has yours taken a campus tour? The myth: A liberal arts degree won’t pay the bills. 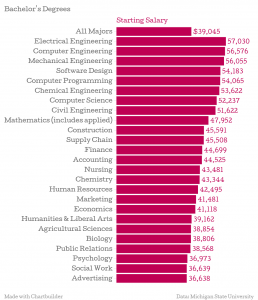 The reality: Sure, grads with business or STEM (science, technology, engineering, and math) degrees tend to earn above-average salaries. But many liberal arts majors do as well or better. Case in point: The top-earning 25% of history majors earned a median annual lifetime income of $85,000 vs. $82,000 for computer-programming majors, per a recent analysis by the Georgetown Center on Education and the Workforce. And in some careers, lower salaries are offset by better job security. The typical education major earns $42,000, but only 4% are out of work. 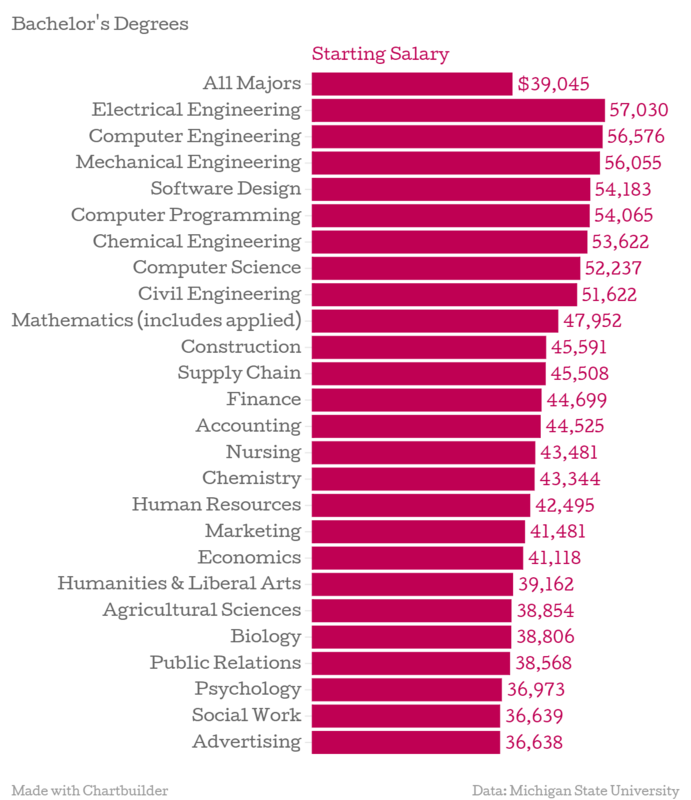 Biomedical engineers pull in $68,000, but 11% are unemployed. Besides, many people end up in fields unrelated to their major — an analysis of alumni by Williams College math professor Satyan Devadoss found that some arts majors went into banking, engineering, and tech, while some chem majors ended up in government and education. Also, a Chronicle of Higher Education survey of employers found that previous work experience was more important than one’s major in hiring recent grads. Focus on practical help. When comparing colleges, see what each offers to assist your child in developing work skills, says Andy Chan, VP of career development at Wake Forest University. Find out if the career office reaches out to freshmen, offers courses in résumé building, and helps students land paid internships. Some 60% of 2012 grads who held a paid internship got a job offer, according to the National Association of Colleges and Employers. The myth: Student loans will cripple your child financially. The reality: You’ve heard the horror stories about college grads hobbled by debt, and the facts can indeed be scary: The typical student at schools such as American University and NYU leaves with over $35,000 in loans; 2% of all student borrowers owe more than $50,000. Rising costs are one reason for those hefty debt loads, but a less obvious problem is the increasing time young people are taking to get their degrees. Just 32% of public college students and 52% who attend a typical private school get out in four years — taking six years is more common. At more selective schools like Davidson and Lafayette, on the other hand, 85% or more of students finish in four years. Plus, such schools tend to offer strong alumni networks that can help with job leads. “If you can attend a good school that helps you graduate on time with great skills and contacts, borrowing can be worth it,” says O’Shaughnessy. That’s especially true if taking on a manageable amount of debt will help your child attend a better school than your family could otherwise afford. “Manageable” is the operative word. Get your kid’s stats. Check graduation rates for the schools your child is interested in at college navigator.gov. Find the likely salary of careers he might pursue and the typical income of students who graduate from schools on his list at PayScale.com. Use the right benchmark. To ensure payments will be bearable, your child should borrow less than what she can expect to make in her first job, says Kantrowitz. The average grad’s $27,000 in loans would total $33,000 with interest over 10 years, if the 3.9% rate recently worked out by Congress goes into effect. (That rate is tied to 10-year Treasuries and is likely to rise in coming years for future borrowers.) If your child earns a typical starting salary of $45,000, she could afford that debt. Don’t fight the feds. For student borrowers, government Stafford loans, which limit debt to $31,000 over four years, are the best bet. Unlike private loans, the federal program offers income-based payment and public-service debt forgiveness, says Lauren Asher, head of the Project on Student Debt. See PLUS as a minus. Parent borrowers should just say no to federal loans. PLUS loans let you borrow the full cost of college regardless of income, at expected rates of about 6.4% (plus fees of at least 4%), which can rise to 10.5% for future borrowers under the new rate formula. “You can borrow more than you can afford at a high rate — what can possibly go wrong?” says policy analyst Rachel Fishman at the New American Foundation. A lower-rate option that limits how much you can borrow: a home-equity line of credit (4.5% to 5%). The myth: Starting at community college, then transferring, is a great way to cut the cost of a BA. The reality: Sure, community college is a lot cheaper than a four-year school, but students who start there are less likely to earn their bachelor’s degree..
Part of the problem: Many four-year colleges make transferring credits tough. While two-thirds of states have articulation agreements to ensure that community-college courses are accepted at specific four-year schools, loopholes abound — some allow discretion about which credits to accept, or a certain GPA may be required. And articulation agreements shouldn’t be confused with a guarantee that your child will get an open slot at a four-year college, says Stephen Handel, a College Board specialist in community colleges. For many teens, the lack of a strong peer group also makes it hard to stay focused, says Tatiana Melguizo, a USC associate education professor; community college students tend to be older and attend part-time. Go for ironclad. See if any community colleges in your area offer a guaranteed transfer to a four-year school. In Virginia, 23 community colleges guarantee admission for students with high GPAs into certain programs at 20 state four-year schools. Others, such as Portland Community and Portland State University in Oregon, offer co-enrollment programs that allow students to shift seamlessly into the four-year program after earning a two-year degree. Talk to the target. Ask the admissions office at the four-year school your child wants to attend about the transfer requirements and how many two-year college students it accepts. The good news: “If your child does transfer, her odds of getting a BA are as good as those for four-year college students,” Melguizo says. Savings and a degree? Maybe you can afford grad school after all.